Wow. Here is a quick hit that waited until most marketers left their office for the weekend. According to this New York Times story, one of the world’s largest consumer products companies, Procter & Gamble, is making a radical decision to eliminate more than half of its brands. As the story notes, P&G plans to eliminate over 100 low-performing brands while retaining the 80 best performers. 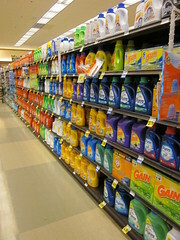 As the story notes, the brands P&G will retain represent 85% of the firm’s profits and 90% of sales. Which brands are to be pushed out is not identified. However, it appears the firm’s leadership is looking to sell off the brands instead of simply discontinuing them. Obviously this is major news in consumer marketing. A decision of this magnitude is rare. Besides the number of brands affected, the number of employees who will lose their jobs may be significant, though an acquiring company will likely try to keep some workers associated with the brands they purchase. The move to consolidate is almost certainly a trend we will see continue within many other industries. Certainly, for marketers of leading consumers firms this could be a long weekend since, come Monday morning, they may be summoned to the CEO’s office and told to evaluate their company’s product portfolio to determine whether product consolidation is something they should also be doing.